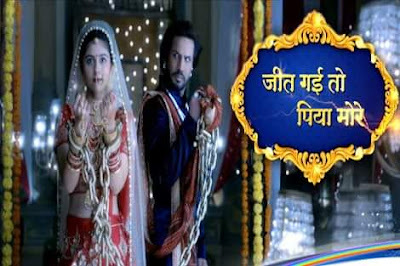 'Jeet Gayi Toh Piyaa Morre' is an upcoming Serial on Zee Tv. The serial is produced by renowned producers, Jay and Kinnari Mehtaa.It will premiere on August 21st, and will air from Monday to Friday at 7PM only on Zee TV! The show is an adaptation of Beauty and the Beast set against the backdrop of a long-standing family feud in a small town of Rajasthan. The show captures the journey of a girl called Devi who isn't scared to ask the right questions. She is not driven by the dictats of destiny but is determined to write her own script and tame the beast of her life, rather than wait for a prince charming to rescue her. Jeet Gayi Toh Piyaa Morre will premiere on August 21st, and will air from Monday to Friday at 7PM only on Zee TV! It is the story of Sujaangarh where the Chauhans and the Rajawats have been at loggerheads for decades. Their animosity was known to the entire village and the Chauhan's felt that marriage into the Rajawat's was a curse, but fate took an unfortunate turn and the Chauhans were forced to get their daughter Devi married to Adhiraj, the youngest son of the Rajawats. Each day of her married life was a trial and with every new challenge, Devi becomes more determined to take charge of her own destiny and transform Adhiraj from being a monster to being the husband of her dreams! Krrip Kapur Suri said, 'After two years of strenuous hard work, once my last show wrapped up, I took a three month break to unwind and think about what I wanted to do next. I am a hungry actor and wanted to take up something distinctly different from my previous role. When I heard the story of Jeet Gayi Toh Piyaa Moree, I immediately liked the character as this would give me lot of scope to experiment with my look and even display my versatility as an actor. It is a love story where the hero is more of an anti-hero - a cruel man with grey shades. I consider myself lucky to have landed this differentiated role on television. We are here to entertain our viewers and I am sure the audience will love the show and my character'.